Understanding how molecular clouds form and evolve has become an increasingly important topic in astrophysics, since this is necessary for studying star formation in local galaxies, as well as how galaxies formed at early redshifts. This simulation shows the evolution of gas in a spiral galaxy, following the passage of a region of gas around a galactic disc. Gas accumulates into dense molecular clouds (dark red) by a combination of cloud collisions in the spiral arms, and gravitational instabilities. Supernovae feedback, which can be seen as small 'explosions' in the simulation, then disrupts the clouds on a timescale of a few, to 20 or so Myr. Supernovae and cloud collisions maintain a very dynamic interstellar medium, and contrary to many theories of star formation, the majority of the clouds are actually gravitationally unbound (Dobbs et al. 2011). 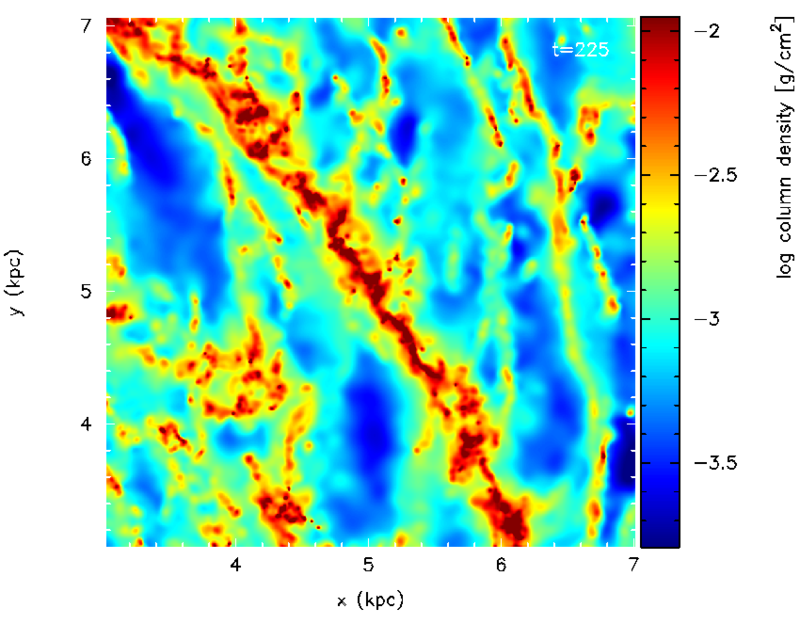 These simulations allow us to test how well theoretical models reproduce clouds in nearby galaxies, by comparing properties, such as cloud rotation, the cloud mass spectra, and their virial parameters to observations (Dobbs et al. 2011, submitted). Click on the image to see the movie!